Thai Lily was purchased impulsively and I’m so glad I took the chance. This candle smells really pretty and it’s definitely not your average floral scent. But then, I expect nothing less from Illume. Every fragrance I’ve tried from this company is complex and exotic but also soft and beautiful. Thai Lily was exactly all that and more. What a pretty candle this was!! The vessel was from their Cameo line and the pattern was so bright and colorful. See visual reference above. Okay, that is why I loved this scent the moment I smelled it. Mango, blood orange and white nectarine? Yes please!! The Asiatic lily definitely dominated more than anything else but blended with all those other fruity notes created a sensual and exotic fragrance that was really lovely. I loved it! I decided to burn this candle in a medium sized bedroom – once lit, it didn’t take long before the candle reached a full melt pool and after that… wow!! The fragrance was pretty amazing and complex. The aroma, exactly as it smelled when I first opened the box… a zesty floral so bright, it filled the entire room with the freshest aroma of lilies and citrus. I could even detect the subtle notes of Brazilian teak and musk – all blended so fluidly, not one note stood out more than the other. I enjoyed it so much. I found myself taking deep breathes of this scent every time I walked into the room. I loved it. Strength – amazing! This candle filled every nook and cranny of my guest bedroom with aroma and even started spilling into the hallway beyond the room. On a scale of 1 to 10, I would rate this candle am 8/9 in a medium sized room. 10 in a smaller room. 6/7 in a larger room. Not bad. This candle burned perfect. No wick issues. Clean and even burn from beginning to end. 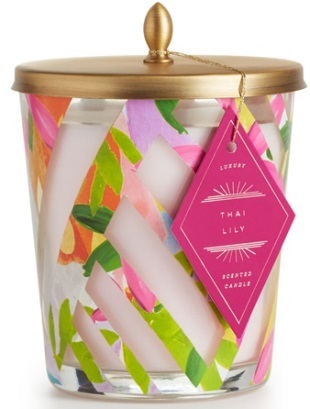 I loved Thai Lily and will for sure purchase it again and that’s saying something considering I’m not a fan of floral scents. To me, it wasn’t your average floral. It was fresh, sweet, zesty and bright. The lily component was definitely there but not overpowering. The zesty notes of blood orange, teak and musk helped tone down the floral creating a lovely and sensual aroma you’ll love. Definitely a must try if you love fresh scents. This sounds beautiful. I will definitely look at this candle company the next time I need to replenish my candle stash! The scent sounds lovely! Thanks for a great review!